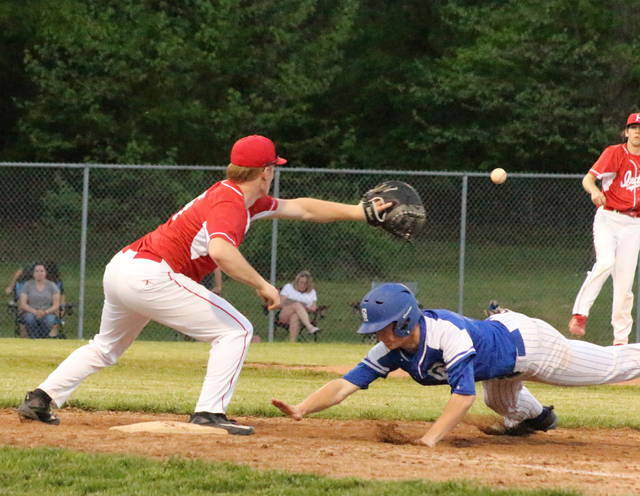 Gallia Academy junior Bo Saxon, right, slides into home during a force out in the seventh inning of Monday night’s Division II district semifinal baseball contest against Hillsboro at Rannow Field on the campus of Athens High School in The Plains, Ohio. Gallia Academy junior Josh Faro (11) delivers a pitch during the sixth inning of Monday night’s Division II district semifinal baseball contest against Hillsboro at Rannow Field on the campus of Athens High School in The Plains, Ohio. THE PLAINS, Ohio — The Blue Devils were held hitless, but this game could have been won without one. The Gallia Academy baseball team left the bases loaded with nobody out in the top of the seventh and ultimately ran out of luck in the home half of the eighth as seventh-seeded Hillsboro got an RBI-single from Ethan Watson to claim a hard-fought 1-0 decision on Monday night in a Division II district semifinal held at Rannow Field on the campus of Athens High School. The sixth-seeded Blue Devils (12-12) struggled offensively as the guests went down in order in half of their eight innings at the plate. In fact, the Blue and White mustered only four baserunners over the first half-dozen innings, and only two of those runners ended up being stranded. In the seventh, however, Gallia Academy started making a little noise on the base paths, and it did so without the benefit of a hit. Josh Faro led the inning off by reaching on an error, then Bo Saxon entered for Faro as a courtesy runner. Saxon advanced to second on a walk to Garrett McGuire, who was then replaced at first by pinch-runner Trent Johnson. Morgan Stanley followed by being hit by an 0-2 offering, which loaded the bases with nobody out. Dylan Smith hit a chopper to shortstop Hayden Haines, who fired a strike home to catcher Justin Scott in time for a force out on Saxon. With one away and the bags still full, Andrew Toler hit a dribbler between the pitcher’s mound and first base. HHS pitcher Luke Magulac tracked the ball down and released a throw to Scott. Johnson made a head-first dive into home plate and appeared to have beaten the relay throw, but Scott’s stretch and scoop on the throw was ruled an out at home — keeping the game scoreless with two away in the seventh. Cole Davis followed by popping up an 0-1 offering to first base, allowing the Indians (14-11) to get out of their dilemma unscathed. The Red and White — who left the bases loaded in the bottom of the sixth — went down in order in the home half of the seventh, which brought on extra-innings. The Blue Devils went down 1-2-3 in the top half of the eighth, then Hillsboro finally found a small amount of luck against Faro in its half of the frame. Mason Stanley started the inning with a leadoff walk, then moved over to second on a sacrifice bunt by Payton Bell. Three-hole hitter Kelton Anderson received an intentional walk to put runners at first and second with one away, which ultimately set up the dramatic finish. Watson — who accounted for half of the Indians’ four hits — hit a line drive one-hopper to Toler in centerfield. Toler fielded the ball cleanly and fired the ball home as Stanley rounded third and headed to the plate. 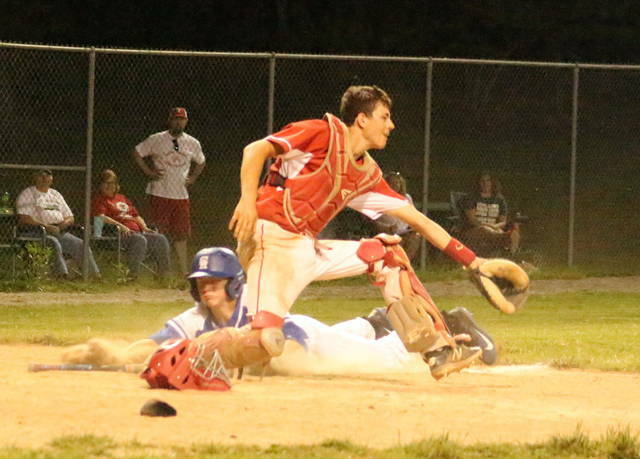 The ball reached made it home in time, but it skipped past the Gallia Academy catcher and went to the backstop as Stanley slid into home safely — giving Hillsboro the 1-0 triumph. 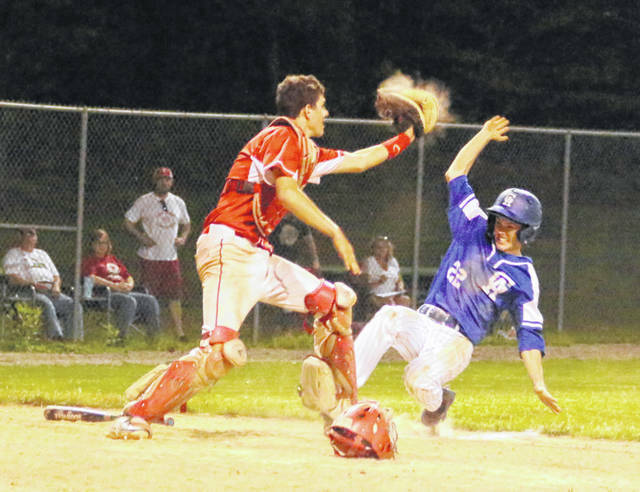 Both Gallia Academy and Hillsboro committed two errors apiece in the contest, with the hosts stranding eight runners on base. GAHS, conversely, left five on the bags. It was a bittersweet end to the 2018 campaign as GAHS coach Rich Corvin acknowledged afterwards. The 15-year mentor also told his troops that this would be his last game as skipper following the setback. Caught up in a world of emotions, Corvin gathered himself and spoke highly of his team, his opponent and the game that was played. “We just didn’t get it done in the seventh. We had a world of opportunity there to score, and we preach situational hitting, but we just couldn’t get it done when we needed to,” Corvin said. “I want to tip my hat to Hillsboro because their pitching is a lot better than the report we had on them. Those two guys were obviously pretty good to hold us without a hit over eight innings. Faro, who started and went the distance for Gallia Academy, gave the guests plenty of chances as the junior southpaw fanned eight and allowed only three baserunners through the first five innings of play. Hillsboro, however, found some life in the bottom of the sixth as a single, an error and a walk left the bases loaded with one out in the inning. With five-hole hitter Jared Thompson headed to the plate, Faro recorded a strikeout and then induced a ground ball out off the bat of Magulac — keeping the game scoreless through six complete. 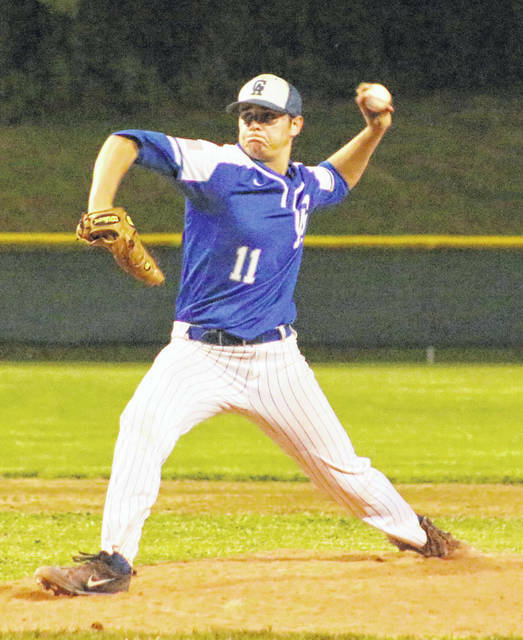 Magulac lasted seven strong innings on the mound for HHS, while Ethan Humphries completed things for Hillsboro with one inning of relief in the eighth. Humphries ended up getting the win after fanning two in one inning of relief, while Faro took the loss after surrendering an earned run, four hits and four walks over 7⅓ frames while striking out 11. Magulac also fanned 10 and walked three in seven innings on the mound. Watson had two hits to pace the Indians, who advance to face fifth-seeded Circleville in the district final on Wednesday evening. Thompson and Payton Bell also added a safety apiece in the triumph. Toler reached base three times, but never made it beyond first. Garrett McGuire was on base twice, while Faro, Stanley and Cole Davis also made it safely aboard one time each. Like it might be for Corvin, Monday was also the final baseball game for seniors Kaden Thomas, John Stout, Adam Sickles, Matt Moreaux and Dylan Smith in the Blue and White. Corvin, the winningest baseball coach in GAHS history with over 200 victories, is proud of his five upperclassmen and what they’ve accomplished during their time at GAHS. The Blue Devils finished the 2018 campaign with an 8-6 mark in Ohio Valley Conference play.